This is the story of how I got roped into making a new Opportunity Quilt, after problems arose with copyright issues with the quilt that we had already made. After all was said and done, we made that top in two days, put the border on it another day, then had it long arm quilted, and the whole thing was ready for showing in a total of about 3 weeks. We only had a month and a half to sell tickets for it, and made $6500 for the Amador Valley Quilt Guild. Not bad, if I do say so myself. 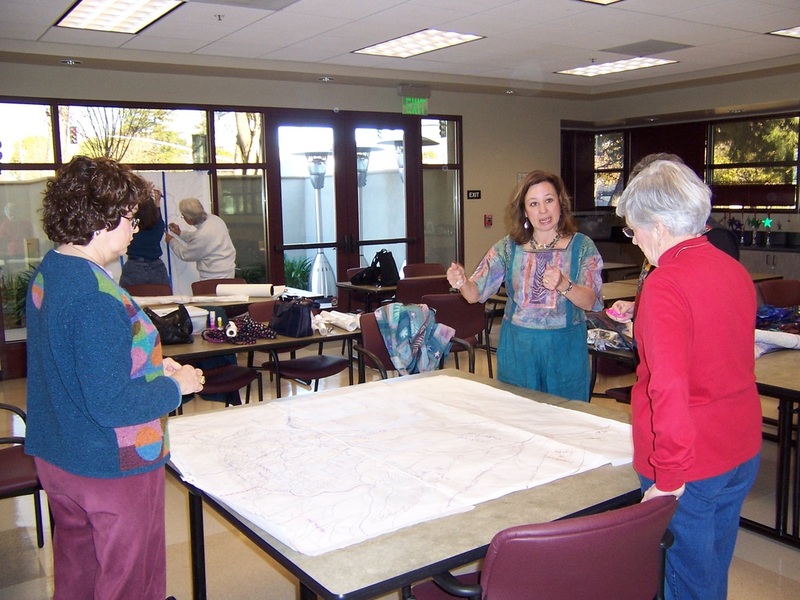 Ever since 1983, when I moved to California, I have belonged to Amador Valley Quilters, a group residing in Pleasanton, California. I've helped bring about many quilt shows, I've held several board positions, I was even President, but I NEVER (no matter what the President for 2006 says) volunteered to create the Guild's Opportunity quilt. I was, however, very flattered to be asked to be the Featured Quilter for our Show in April, 2007, and was looking forward to it, UNTIL, two days before Christmas, I was asked to help the Guild create a new Opportunity quilt. The way the President (Diane Saugier, a very wily woman) put it, wouldn't it be so cool for the Featured Artist to lead the Guild Quilt that would be raffled at the Quilt Show where she was Featured Artist? Spread with the VERY best butter, you know, but still an irresistible challenge. I cannot resist a Challenge or a deadline, it's a failing that I have GOT to overcome, some day soon. Now, it wasn't that I'm not always willing to make a new quilt, it's just that it was a Very Bad Time to add more to my life at that point (son and daughter moving home after 4 years away, 40 people coming for New Years Party, etc. ), and I've always worked alone. I make my own fabric choices, do my own piecing, appliqué, marking, fabric painting, quilting, and binding, because I figure that if I do it myself, I can't blame anybody else if it goes wrong. This was a whole new ball game, and I wasn't a bit sure that I could direct a group of people, most of whom are traditional quilters, to work in an "art quilt" frame of mind. It did, actually, help that part of our directive was that the new quilt couldn’t be anything like the traditional quilt that had preceded it, so the more "art quilty" the project, the better. This quilt definitely fit the bill, but it was going to stretch those traditional quilters forever, and once you stretch a rubber band, it never quite goes back the way it was, does it? Maybe that's a good thing. So, after consultation with the Board and after a Past Presidents Pie Party for moral support, the project began to come together. The Past Presidents each donated $20 for materials, and work on the quilt was begun. Luckily, in the chaos surrounding my daughter moving home, my original drawings for the quilt I had recklessly proposed for the new Opportunity Quilt came to the surface – it had been a year since I created the original 3 quilts I made from the photograph. I contacted my brother, John, who immediately gave his written permission to use his photograph for the Guild quilt. My husband took the drawing to the copyshop and got it enlarged to the new proper size. On Tuesday, my class (I teach an ongoing quilting class for the Pleasanton Adult School) and several others from the Guild, joined in to trace the pattern onto Totally Stable and freezer paper, making the templates that would be used to create the quilt, and divided it up into sections. One woman began cutting sheers with a woodburning tool, while others began working on the tree, using my Embellisher machine and various yarns and rovings, felting it together. One lady took the bird pattern home and created the eagle on Totally Stable, which was a huge undertaking and gratefully accepted. On Saturday before the Guild meeting, I painted the sky and back of the quilt. On Sunday, the President lent us her high school classroom, and 13-15 of us got really cracking on the quilt. 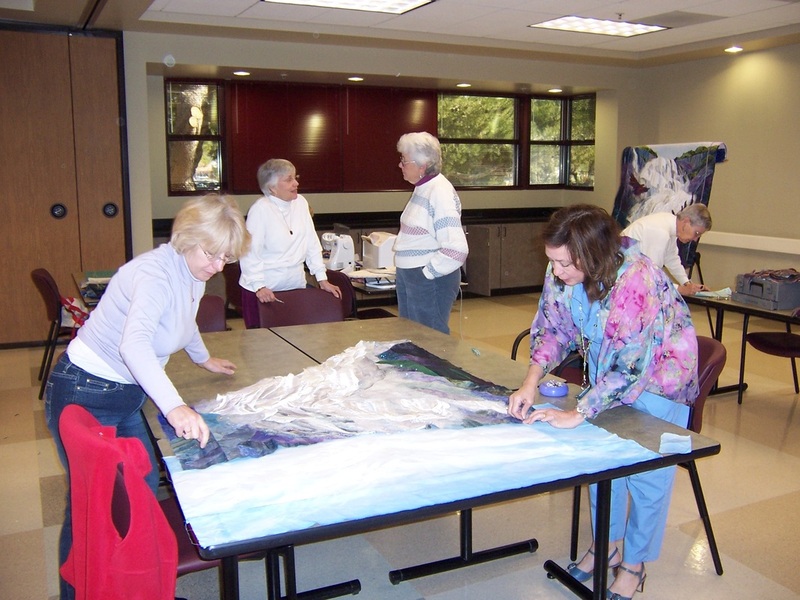 Some people cut sheer fabrics with a woodburning tool; one painted and glittered and melted cellophane; while still another group worked on finishing the tree. Pattern sections were given to teams of sewers, and the real cutting and creating began. Section by section, silks and sheers, cottons and hand dyed fabric were cut, shaped, ironed, and eventually appliquéd, then embellished with Misty Fuse, Angelina Fiber, silk batting, Tintzl, and sheer fabrics. By the end of the exhausting day, 10 of the 14 sections were completely sewn, two partially done, and two not started. Many thanks to the people who brought card tables, irons, electrical connections, their sewing skills and open minds to the project, and especially to the President's husband, who carted stuff about, got the lunch, and was a general all-around nice guy! All day Monday, I worked on finishing up the unfinished sections and started sewing the sections and borders together. I took it to Tuesday morning group again, where two people finished up the last border, I put the sky together, and everybody pulled the Totally Stable off the back. There were a few problems, but they were overcome in the next couple of days, and by Thursday night, the thing was DONE! Luckily, I didn't have to quilt it, that was a job for the next, really capable person. It is a very interesting experience to gift someone else with the capability to create the quilt that resides in your own mind. Luckily, I had the original quilt there, at the workshop, and they could SEE what they were trying to recreate, but I give them full credit for truly visioning and recreating what they saw, even though it was totally against their principles. How many people do YOU know who will take Misty Fuse, lay it down on rock fabric, then add silk batting, Angelina and Tintzl fabric, and fuse it and call it "water over rock"? How many people will take a piece of cellophane, paint it with perle fabric paint, dribble glitter over it, then melt it with an iron over parchment paper and then use heat gun and make tiny bubbles? When was the last time YOU melted iridescent cracked ice to make water flowing over rock? I'll tell you, MY GUILD WILL! They'll do whatever it takes, whatever you need, they're there, kind of like the Three Amigos. Incredible. The trust, the confidence, the flowing creativity was a living thing, with everyone taking the general guidelines and running with it. This quilt was a living, breathing, creation, and it was an honor to be in the presence of it being born. On the other hand, maybe I should hire out to make new Guild Opportunity Quilts; maybe I should create one of those spurious ads saying things like: Need a group quilt? Call Me! I'll help you create a new Opportunity Quilt in two weeks! Well….maybe not. Something tells me that would be a REALLY STRESSFUL way of making a living. 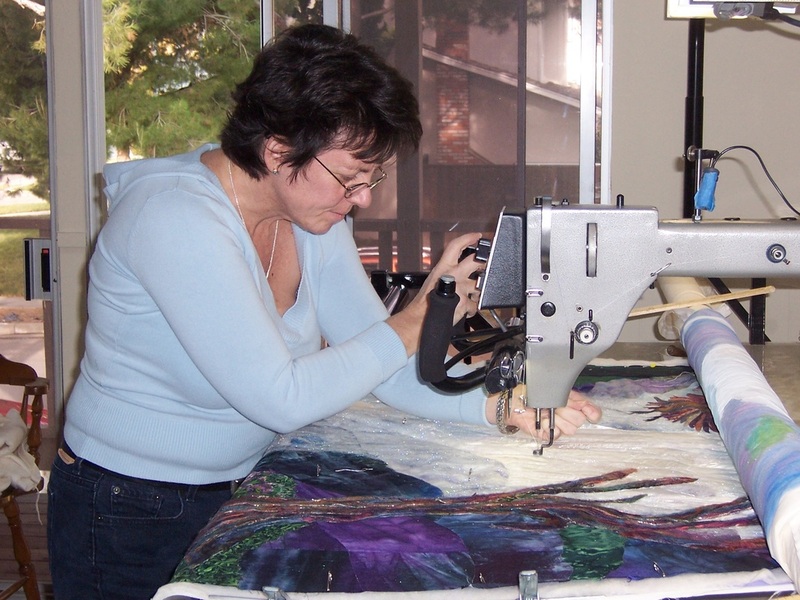 Charlotte McConkie and Susan DelBoccio working on their part of the quilt. Cindi Young, longarm quiltling the quilt. 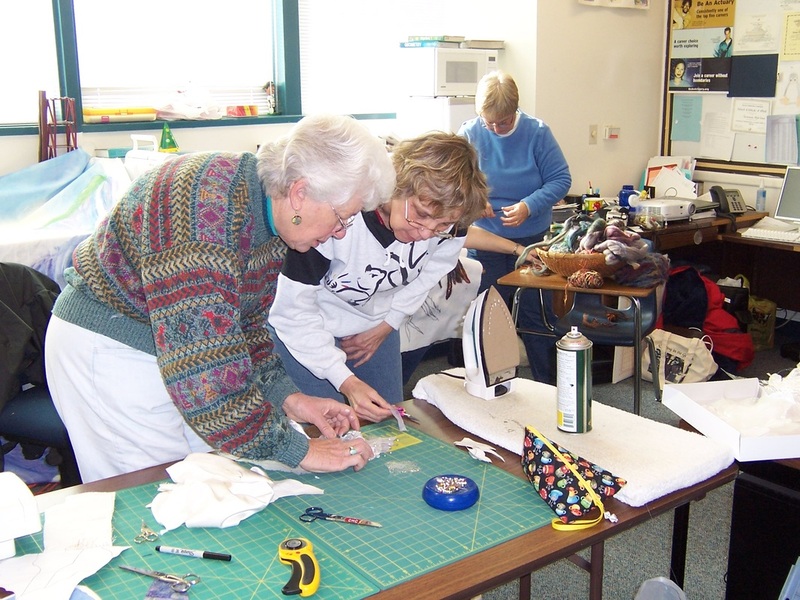 The Tuesday Quilters putting it together, with Sue Mead and I in the foreground, Charlotte McConkie and Rae Hooks in the background. Janet Lide, Rae Hooks and I deciding how to section up the drawing to work on.